Zombie Weapons – Top Ten Guns for the Zombie War | We Zombie! 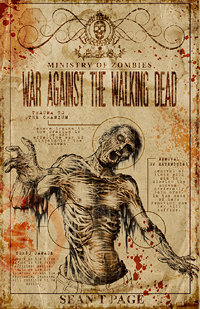 Sean T. Page, of the Ministry of Zombies in the UK, has a new book out called War Against the Walking Dead. Sean sent me a copy and I just finished reading it – what a great book! I’ll be posting a review, but for now, with Sean’s permission, I am paraphrasing a section in the book titled “The Top Ten Guns for the Zombie War” (Newsflash – America loves guns). Sean explains that this a a great list of guns to acquire before the zombie apocalypse arrives, and it is based on zombie fighting expert George Crabbe’s recommendations. Oh, and check with your local and national laws before trying to purchase these guns. 1. The AK 47, the world’s most popular weapon, adopted in over 50 countries as the weapon of choice for their troops. It fires a 7.62 x 39 Soviet round, and can be acquired with various stocks and ammo capacity from 10 round clips to 75 round drums. Accuracy is around 100 yards and cost is around $500. George’s tip: The piston system this rifle works on is so dependable that the rifle hardly ever needs to be cleaned. At the very most, clean after every five drum mags. 2. Heckler & Koch G3, a very dependable rifle available in most European countries, being made in Germany. It works on a rolling-block system and this means there is little to no real need to disassemble this weapon. It uses a .308 round (7.62 x 51) with a max mag capacity of 20 rounds. The accuracy is amazing at 1,500 yards! George’s tip: A simple brush down the barrel and some oil and you are set to go face the walking dead again. 3. Heckler & Koch M93, which is basically the same as the G3, but it uses popular 5.56 rounds (.223 Remington). Magazine capacity ranges from 20 to 30 rounds. Accuracy is 1,000 to 1,500 yards. George’s tip: What German gun manufacturers don’t know about the upcoming zombie war and the need for robust firearms, ain’t worth knowing. 4. Henry US Survival Rifle. An awesome rifle to have in your bug-out bag, it fires a .22 cal. long rifle cartridge and requires little to no cleaning. George included this rifle on the list because of its ability to break down into its own stock, which, when in-stock acts like a flotation device. It’s water resistant and each clip holds 7 rounds. It has a cost of around $250 and a maximum accuracy of 50 to 100 yards. George’s tip: Though not recommended for use as a main weapon it makes a great back-up weapon should you lose your main gun or somehow break it. 5. Marlin Model 336 Lever Action Rifle. Common in the US in calibers ranging from the Marlin 444 to the common 30/30. Easy to take care of and doesn’t require field stripping – just oil its main workings and brush down the barrel. Probably one of the simplest and easiest weapons to use next to a bolt-action rifle. It has a mag. capacity of 5 or 6 rounds depending on the caliber, and has a maximum accuracy of around 150 yards. George’s tip: This was the rifle of choice for winning the West and is a very good choice for the zombie apocalypse. 6. Remington 700 BDL Bolt Action Rifle. This rifle can be found all over the world and although it works great with the factory sights, it’s even better with a scope. Can be bought in almost any caliber made and cleaning is almost non-existent – just a little oil and a brush down the barrel. Round capacity is a max of 5, cost for a new rifle is between $500 and $800, and it has a maximum accuracy of 100 yards (iron sights) to 1,000 yards with a scope. George’s tip: When you order one of these rifles from the company, you can get it with a scope already zeroed in for you for up to 100 yards – all ready for zombie busting. 7. Mosin Nagant Bolt Action Rifle. This fine bolt-action rifle is fast becoming the new craze is the US and rightly so. It takes a 7.62 x 54R cartridge that rivals the US made 30.06 round used in most hunting rifles. The iron sights can be adjusted for up to 200 yards, typically comes with two cartridge pouches, a sling, and a bayonet, all at a cost between $100 to $130. Cleaning is similar to the Remington Bolt Action and Marlin Lever Action. Maximum capacity is 5 rounds with an accuracy of 100 yards (iron sight) to 1,000 yards with a scope. George’s tip: Hopefully you’ll never get close enough to a zombie to need it, but there may be times when the bayonet thrown in with this rifle saves your bacon in the upcoming war against the walking dead. 8. Colt 1911 Auto Pistol. A handgun that served the US military all the way up to the Vietnam war and is a survivor among handguns. The simplicity is only outmatched by the powerful .45 acp round it fires. Each clip holds up to seven rounds and there are lots of manufacturers other than Colt so you can find many models of the 1911 out there. Some fire the traditional seven rounds, but there are models that use 12 and 13 round mags. 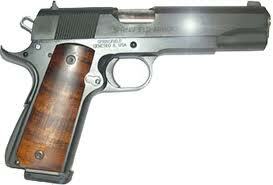 George’s tip: The Colt 1911 pistol is the only pistol ever to fire and cycle another round successfully under water. You never know when you are gonna need that kind of firepower in the days ahead. 9. Beretta Model 92 FS. This weapon replaced the Colt 1911 handgun in the early ’90′s and has served US soldiers through thick and thin, with magazines holding up to 15 rounds and even some after-market mags. holding up to 30 rounds of 9 mm firepower. It retails on the civilian market for around $550 to $600 and usually comes with two magazines. George’s tip: A modern classic, straight from the United States Army, this pistol will serve you well. 10. Springfield Armory XD9. This robust pistol comes with 2 magazines holding 16 rounds each and normally a holster and clip pouch. The trigger pulls real easy and has what’s called “combat safeties” because the gun will not fire until it is in your hand in the shooting position, making it a good choice to wear around the survivor community. Extra clips be bought bringing it up to 20 and 30 round magazines, and costs between $550 and $800 depending on the caliber. George’s tip: This handgun holds a special place in my heart because I personally own this pistol and ue it as my concealed carry weapon – perfect when dealing with distrustful robber barons. In summary, it is no easy task to kill a zombie with any kind of handgun, rifle, or automatic weapon. You need a good head shot destroying at least 80 percent of the brain as a rule of thumb. You must discount the idea of small arms to solve all your problems. As experienced zombie fighters often say, you can’t miss fast enough with a gun. George’s sage: These top ten weapons are the simplest and easiest weapons to acquire. I should point out that when it comes to cleaning a firearm, you don’t have to strip it down part by part. This is a common mistake made by new gun owners. For a rifle or handgun to work properly, lubricant is the key, and my choice of lubricant is WD40. It not only lubricates, but is also prevents rust, and when you spray it down into you weapon’s action, it will remove any powder score and lubricate the parts at the same time. Then, just take your cleaning brush down the barrel to clear away lead and powder buildup in the barrel and you weapon is ready to go again. Do this when you have a quiet moment between battles with the walking dead and your firearm should last you long after the dead rise. This entry was posted in Books, Commentary. Bookmark the permalink. Greetings! I stumbled your site on Twitter. use it on my page (free netflix account). Nice to hear from you, Bill. I’m sorry if my response seemed overly condescending. I’m reading back, and it kinda did. That’s my bad. Anyway, yeah, that accuracy sounds about right for most AKs. I was just saying that “accuracy is 100 yards” doesn’t really make sense. And yeah, when I made reference to magazines being referred to as clips, such as in the articles for the AK-47 and Henry Survival rifle. I’m familiar with the differences, and it’s just a bit of a peeve of mine when people confuse them. Again, sorry if I seemed arrogant or anything. If you didn’t write this, then I of course means no offense towards you. But it seems as if the original writer needs to do a bit more research on the subject. No worries – didn’t sound arrogant to me – I would call it “passionate”. I’m glad you spotted the errors, and value your posts. Oh, note: By “magazines are referred to as clips”, I’m referencing how they’re referred to in the article, not implying that referring to them as clips was the correct way. Realized that came out convoluted. I got you – many people use the term magazine and clip interchangeably – and really a clip and magazine are two different things. Perhaps that’s what you are referring to. I found a great article on the differences at http://www.minutemanreview.com/2008/09/clip-vs-magazine-lesson-in-firearm.html – it helped clear it up for me. On #2, the G3 is described as a “rolling block.” A rolling block is a type of single-shot action, mainly seen on rifles originating in the 1800s. The HK uses a roller-delayed blowback system. #5: The Marlin 336 is described as the gun that won the West. Given that the rifle was made in 1948, that’s unlikely. The Winchester 73 was the rifle most commonly stated to have won the West. If they’re referring to the 9mm pistol that replaced the 1911, it was a 92FS. The 82FS was a compact .32 ACP, and appears to be the gun pictured. Also, it started replacing the 1911 in ’85. #1 – AK47 – It does sound like the author is saying that the system is so dependable that you don’t have to clean it often. Hopefully he’s not saying we should ignore the cleaning – that would be poor maintenance. Wikipedia has an article comparing the AK47 to to the M16 and it mentions the accuracy of the AK47 is 2-4 inches@100 meters. Not sure how that compares or is measured. #2 – You are correct about the rolling block vs. roller-delayed blowback system on the G3. #5 – Right on – the 336 was first manufactured in 1948. #9 – My bad – I copied the article and accidentally changed the 92FS to an 82FS. The author was talking about the 92FS. When I selected a picture for the article, I grabbed a pic of the 82 which is indeed a compact .32 ACP. I’m fixing that now!